The bridge is one of the parts of a violin, cello or other string instrument which has a tremendous effect on its sound. There is a simple reason for this: the bridge transfers the vibrations of the strings to the body of the instrument. Even the finest violin will not be able to develop the full range of its acoustic spectrum if this sonic transfer is impaired by a poorly crafted or badly positioned bridge. This is why adjusting the bridge is a task which should only be entrusted to a luthier: it is an important step in optimising and refining the sound of an instruments. How are the vibrations transferred? The motion of the vibrating strings makes the bridge vibrate as well. As the strings oscillate in what can be envisioned as a rapid elliptic back-and-forth underneath the stroke of the bow, the bridge begins to “rock” from one foot of the bridge to the other at a high frequency. This stimulates the right and left half of the top alternatingly, which makes the body begin to vibrate. The bass bar and sound post inside the body deliberately distribute or attenuate certain frequencies of the vibrating bridge: in high notes, the bass bar has a dampening effect so the right foot of the bridge transmits the majority of the vibrations. In this case, the sound post ensures that both the top and the back are directly activated. When lower frequencies are played, it inhibits the motion of the right bridge foot so that the majority of the energy is transferred to the left side of the top and evenly distributed from there via the bass bar. 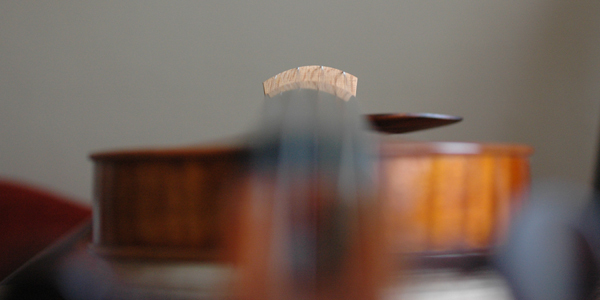 The bridge of a stringed instruments is positioned over the acoustic centre of the top and held upright without needing to be attached in any way: the tension of the tightened strings keeps the bridge in place. It limits the mensur of the vibrating strings, which can continue to resonate “underneath” the bridge as well along the tail and all the way to the bottom nut, which is not the case with lutes and guitars. The proper spot for the bridge can be seen by the notches of the sound holes, and it should be placed exactly between the two. At the same time, the bridge needs to be centred relative to the fingerboard so the strings run along the proper position over the fingerboard. 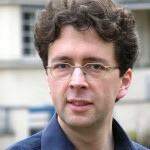 The greatest priority, however, is focusing on the acoustic centre of the top so that the vibrations of the strings can be ideally transferred to the body of the instrument. The angle of the bridge is an important factor as well; it needs to be perpendicular to the top. Since tuning the strings with the pegs pulls the bridge towards the fingerboard, you may initially tip it somewhat towards the tail, especially if it has been newly positioned or new strings are put on. 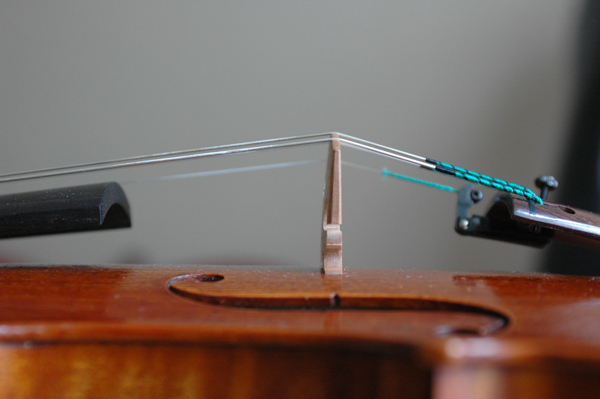 The position of the bridge can still be slightly corrected as long as the strings have not yet achieved their regular tension. To prevent the bridge from tipping, it should always be handled from both sides at once: for example, you can use your thumb and index finger or both thumbs. Please note: a crooked bridge not only does a poor job of transmitting the vibrations properly, it will also warp over time under the pressure of the strings. How is a bridge adjusted? Bridges for instruments in the violin and gamba family are usually carved from maple and have to be adapted for the respective instrument. A major factor here is properly positioning the feet, which have to be carved to fit the contours of the top precisely. The bridge can only transmit the vibrations to the top properly if the feet form a seamless connection to the top. The weight of the bridge and its resonant properties obviously have a critical influence on the instrument’s sound, which means that certain adjustments are possible. The bridge has a cut-out in the middle that is usually heart-shaped, and its carved profile and “kidneys”, as they are known, all serve acoustic purposes, not aesthetic ones. With its inherent vibration properties, the bridge filters out undesired frequencies from the vibrating strings and serves as a impedance converter between the strings and top (or rather, the body). Luthiers use planes and carving knives to adjust the size of the bridge’s cut-outs and thickness until the ideal acoustic properties have been achieved for each respective instrument. By adjusting the curvature of the bridge, the height of the strings can be modified; it must correspond to both the contours of the fingerboard as well as the individual wishes of the performer. Having the strings at a greater height is necessary for soloist performance and for strings with a higher amplitude (especially catgut strings) than it is for synthetic or steel strings. The photos on this page were provided courtesy of master luthier Jean Severin in Weimar.